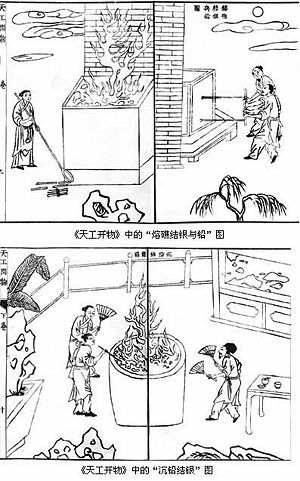 Illustrations of Chinese silversmiths smelting silver ore and separating lead from it. Taken from Tiangong Kaiwu encyclopedia (1637), by Song Yingxing (1587-1666). A furnace (from the Latin word fornax, meaning "oven") is an appliance that produces heat. The heat in a furnace is usually produced by combustion of a fuel such as oil, wood, or natural gas. The heat may also be generated by electricity, as in an electric arc furnace, or by induction heating in an induction furnace. In American English, the term furnace generally refers to the central heater in a home or office, or the heater for an industrial process, and sometimes it is a synonym for kiln, a device used in the production of ceramics. In British English, the term furnace almost exclusively means an industrial furnace, whereas a household heater is called a boiler or heater. Industrial furnaces are used for many applications, such as the extraction of metals from ores (smelting), the running of chemical reactions, or the refining of oil by fractional distillation. A household furnace is a major appliance that is permanently installed to provide heat to an interior space through intermediary fluid movement, which may be air, steam, or hot water. The most common fuel source for modern furnaces in the United States is natural gas; other common fuel sources include LPG (liquefied petroleum gas), fuel oil, coal or wood. In some cases electrical resistance heating is used as the source of heat, especially where the cost of electricity is low. Combustion furnaces always need to be vented to the outside. Traditionally, this was through a chimney, which tends to expel heat along with the exhaust. Modern high-efficiency furnaces can be 98 percent efficient and operate without a chimney. The small amount of waste gas and heat are mechanically ventilated through a small tube through the side or roof of the house. Modern household furnaces are classified as condensing or non-condensing, based on their efficiency in extracting heat from exhaust gases. Furnaces with efficiencies greater than approximately 89 percent extract so much heat from the exhaust that water vapor in the exhaust condenses; they are referred to as condensing furnaces. Such furnaces must be designed to avoid the corrosion that this highly acidic condensate might cause and may need to include a condensate pump to remove the accumulated water. Condensing furnaces can typically deliver savings of 20-35 percent in heating costs, if the old furnace was in the 60 percent Annual Fuel Utilization Efficiency (AFUE) range. The furnace transfers heat to the living space of the building through an intermediary distribution system. If the distribution is through hot water (or other fluid) or through steam, then the furnace is more commonly termed a boiler. One advantage of a boiler is that the furnace can provide hot water for bathing and washing dishes, rather than requiring a separate water heater. A disadvantage, however, is that when the boiler breaks down, it results in loss of both heat and hot water. Air convection heating systems have been in use for over a century, but the older systems relied on a passive air circulation system, in which the higher density of cooler air caused it to sink into the furnace, and the lower density of warmer air caused it to rise in the ductwork. The two forces acted together to drive air circulation in a system, known as "gravity-feed." The layout of the ducts and furnace was optimized for short, large ducts and the furnace was therefore referred to as an "octopus" furnace. By comparison, most modern "warm air" furnaces typically use a fan to circulate air into the rooms of house and pull cooler air back to the furnace for reheating. This is called forced-air heat. Because the fan easily overcomes the resistance of the ductwork, the arrangement of ducts can be far more flexible than the octopus of old. 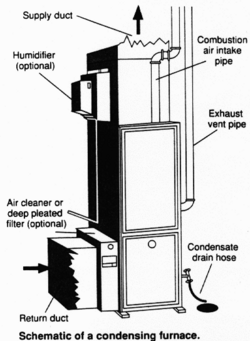 In American practice, separate ducts collect cool air to be returned to the furnace. At the furnace, cool air passes into the furnace, usually through an air filter, through the blower, then through the heat exchanger of the furnace, from where it is blown throughout the building. One major advantage of this type of system is that it also enables easy installation of central air conditioning by simply adding a cooling coil at the exhaust of the furnace. Air is circulated through ductwork, which may be made of sheet metal or plastic "flex" duct and insulated or uninsulated. Unless the ducts and plenums have been sealed using mastic or foil duct tape, the ductwork is likely to have a high leakage of conditioned air, possibly into unconditioned spaces. Another cause of wasted energy is the installation of ductwork in unheated areas, such as attics and crawl spaces; or ductwork of air conditioning systems in attics in warm climates. The following rare but difficult-to-diagnose failure can occur. If the temperature inside the furnace exceeds a maximum threshold, a safety mechanism with a thermostat will shut the furnace down. A symptom of this failure is that the furnace repeatedly shuts down before the house reaches the desired temperature; this is commonly referred to as the furnace "riding the high limit switch." This condition commonly occurs if the temperature setting of the high limit thermostat is set too close to the normal operating temperature of the furnace. Another situation may occur if a humidifier is incorrectly installed on the furnace and the duct that directs a portion of the humidified air back into the furnace is too large. The solution is to reduce the diameter of the cross-feed tube, or to install a baffle that reduces the volume of re-fed air. An industrial furnace, or direct-fired heater, is an equipment that provides heat for a process or chemical reaction. Furnace designs vary as to their function, heating duty, type of fuel, and method of introducing combustion air. However, most process furnaces have some common features. Fuel flows into the burner and is burnt with air provided from an air blower. A given furnace may have more than one burner, arranged in cells that heat a set of tubes. Burners can be floor-mounted, wall-mounted, or roof-mounted, depending on design. The flames heat the tubes, which in turn heat the fluid inside in the first part of the furnace known as the radiant section or firebox. In this chamber, where combustion takes place, the heat is transferred mainly by radiation to tubes around the fire in the chamber. The heating fluid passes through the tubes and is thus heated to the desired temperature. The gases from the combustion are known as flue gas. After the flue gas leaves the firebox, most furnace designs include a convection section where more heat is recovered before venting to the atmosphere through the flue gas stack. In industrial furnaces, a common approach is to heat a secondary fluid called a heat transfer fluid (HTF) that has high heat-transfer efficiency and may contain special additives (such as an anti-rust agent). This heated fluid is then circulated around the whole plant to heat exchangers to be used wherever heat is needed, instead of directly heating the product line, as the product or material may be volatile or prone to cracking at the furnace temperature. The radiant section is where the tubes receive almost all their heat by radiation from the flame. In a vertical, cylindrical furnace, the tubes are vertical. Tubes can be vertical or horizontal, placed along the refractory wall or around the middle, or arranged in cells. Studs are used to hold the insulation together and on the wall of the furnace. They are placed about one foot (300 mm) apart in the following picture of the inside of a furnace. The tubes, which are reddish brown from corrosion, are carbon steel tubes and run the height of the radiant section. The tubes are a distance away from the insulation so that radiation can be reflected to the back of the tubes to maintain a uniform tube wall temperature. Tube guides at the top, middle, and bottom hold the tubes in place. The convection section is located above the radiant section, where it is cooler to recover additional heat. In this section, heat transfer takes place by convection, and the tubes are finned to increase heat transfer. 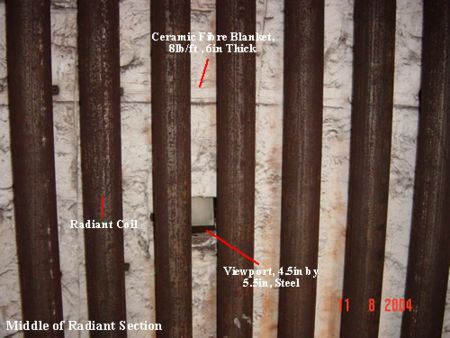 The first two tube rows at the bottom of the convection section and the top of the radiant section form an area of bare tubes (without fins) and are known as the "shield section," because they are exposed to plenty of radiation from the firebox and they also shield the convection section tubes, which are normally of less resistant material from the high temperatures in the firebox. The area of the radiant section just before the flue gas enters the shield section and then the convection section is called the "bridge zone." 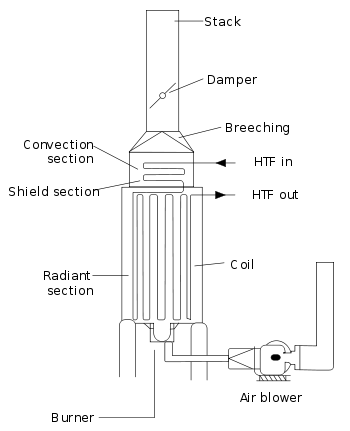 The term "crossover" is used to describe the tube that connects from the convection section outlet to the radiant section inlet. The crossover piping is normally located outside, so that the temperature can be monitored and the efficiency of the convection section can be calculated. The sightglass at the top allows personnel to observe the flame shape and pattern from above and to check for "flame impingement"—that is, whether the flame is touching the tubes, causing small, isolated spots of very high temperature. 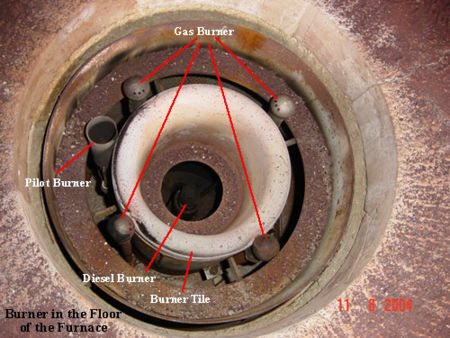 The burner in a vertical, cylindrical furnace is generally located in the floor and fires upward. Some furnaces have side-fired burners, as in train locomotives. The burner tile is made of high-temperature refractory material that contains the flame. Air registers located below the burner and at the outlet of the air blower are devices with movable flaps or vanes that control the shape and pattern of the flame, whether it spreads out or swirls around. Flames should not spread out too much, as this will cause flame impingement. Air registers can be classified as primary, secondary, and (if applicable) tertiary, depending on when the air is introduced. The primary air register supplies primary air, which is the first batch of air to be introduced in the burner. Secondary air is added to supplement primary air. Burners may include a premixer to mix the air and fuel for better combustion before introducing it into the burner. Some burners even use steam in the premix, to preheat the air and create better mixing of the fuel and heated air. The furnace floor is mostly made of a different material from that of the wall, typically hard castable refractory that allows technicians to walk on its floor during maintenance. A furnace can be lit by a small pilot flame or (in some older models) matches. Most pilot flames nowadays are lit by an ignition transformer (much like a car's spark plugs). The pilot flame in turn lights up the main flame. The pilot flame uses natural gas, while the main flame may use both diesel and natural gas. For liquid fuels, the fuel is passed through an atomizer, to prevent the liquid fuel from pouring onto the furnace floor and becoming a hazard. Using a pilot flame for lighting the furnace increases safety and ease (compared to using a match). Sootblowers are found in the convection section. As this section is above the radiant section and air movement is slowed by the fins, soot tends to accumulate here. Sootblowing is normally done when the efficiency of the convection section is decreased. This can be calculated by looking at the temperature change from the crossover piping and at the convection section exit. Sootblowers utilize flowing media such as water, air, or steam to remove deposits from the tubes. This is typically done during maintenance, with the air blower turned on. Several different types of sootblowers are available. Wall blowers of the rotary type are mounted on furnace walls protruding between the convection tubes. The lances are connected to a steam source with holes drilled into it at intervals along its length. When it is turned on, it rotates and blows the soot off the tubes and out through the stack. The flue gas stack is a cylindrical structure at the top of the heat transfer chamber. The breeching directly below it collects the flue gas and releases it high in the atmosphere where it will not endanger personnel. The stack contains a damper that works like a butterfly valve and regulates the draft (pressure difference between air intake and air outflow) in the furnace. The draft pulls the flue gas through the convection section. The stack damper also regulates the heat lost through the stack. As the damper closes, the amount of heat escaping the furnace through the stack decreases, but the pressure or draft in the furnace increases. This pressure increase poses risks to those working around the furnace if there are air leakages in the furnace, because the flames may then escape out of the firebox or even explode if the pressure is too high. Insulation is an important part of the furnace because it prevents excessive heat loss. Refractory materials such as firebrick, castable refractories, and ceramic fiber are used for insulation. The floors of the furnace are normally castable type refractories, while the refractories on the walls are nailed or glued in place. Ceramic fiber is commonly used for the roof and wall of the furnace and is graded by its density and then its maximum temperature rating. For example, a grade of "8# 2,300°F" means the material has a density of eight lb/ft3 and a maximum temperature rating of 2,300°F. An example of a material with castable composition is kastolite. In metallurgy, several specialized furnaces are used, a number of which are listed below. Vacuum furnaces to heat metals and other materials to very high temperatures, in the presence of a vacuum that reduces potential sources of contamination. An outdoor wood-fired boiler (OWB), also known as a waterstove, wood boiler, or outdoor wood furnace, is a heating technology that has grown in popularity in the northern United States. In most cases, an OWB looks like a small shack with metal siding. It is self-contained, connected to the building it heats through underground insulated water pipes. It contains a metal combustion chamber for a wood fire, surrounded by a water tank or water jacket. The fire heats the water, which is then circulated through the insulated water pipes into the building that is being heated. Once the hot water from the boiler reaches the building, the heat can be transferred to most existing heating systems and the building's hot water supply. A damper and fan on the boiler interacts with a thermostat in the building. If the building's temperature falls, the thermostat triggers the damper to open, allowing more oxygen to enter the combustion chamber. As a result, the fire burns more intensely and raises the water temperature, thereby increasing the heat supplied to the building. OWBs offer several benefits that have increased their popularity. Their large combustion chamber accommodates more fuel than many other forms of wood heat, decreasing the number of times an owner has to add fuel to the fire. Home insurance may cost more for people who heat with an indoor form of wood heat than with an OWB. Moreover, for people with a large supply of free wood and willing to invest the time to prepare the wood and stock the OWB, an OWB can be less expensive than heating with gas, oil, or electricity. OWBs are not without controversy, as their emissions sometimes bother neighbors. Some states and municipalities have banned the devices. They are not currently regulated by the United States Environmental Protection Agency (EPA), unlike other forms of wood heat. Recently, however, the EPA has worked with manufacturers to develop a method for them to identify OWBs that meet a voluntary emissions standard. Some studies conducted on OWBs suggest that they may produce more emissions, most notably particulate matter under 2.5 micrometers (PM 2.5), compared with other heating technologies, but manufacturers dispute these assessments. Exposure to elevated levels of PM 2.5 has been associated with cardiopulmonary health effects and premature death. As of July 2006, the Hearth, Patio and Barbecue Association (HPBA) and many of the major OWB manufacturers have requested users of their products to follow the "Outdoor Wood Furnace Best Burn Practices." These guidelines have been set up by the HPBA to help cut down on problems associated with OWBs. Early in January 2007, the United States Environmental Protection Agency (EPA) initiated a voluntary program for manufacturers of outdoor wood furnaces. The EPA's primary intent is to encourage manufacturers to produce cleaner models known as Outdoor Wood-fired Hydronic Heaters (OWHH). The EPA also wants those who buy an OWHH/OWB to buy the cleanest models available, which are those that meet EPA performance verified levels. To participate in this program, manufacturers are developing cleaner models, with the goal of distributing these units starting in April 2007. The EPA now publishes a list of all OWHH/OWB units that pass the new voluntary program. These furnaces come with the 'orange EPA OWHH tag' to notify the customer of the unit's particular emission level output. ↑ The term "high-efficiency" used here may be misleading, because furnace efficiency is typically expressed as a "first-law" efficiency, whereas the exergy efficiency (which takes into account the Second Law of Thermodynamics) of a typical furnace is much lower than the first-law thermal efficiency. By comparison, cogeneration has a higher exergy efficiency than is achievable by burning fuel to generate heat directly at a moderate temperature. Because most consumers are unfamiliar with exergy efficiency, Carnot efficiency, and the Second Law of Thermodynamics, the use of first-law efficiencies to rate furnaces is well-entrenched. ↑ The Outdoor Wood Fired Boiler Project Ringolake.com. Retrieved July 3, 2008. ↑ Outdoor Wood-Fired Boilers Vermont Department of Environmental Conservation. Retrieved July 3, 2008. ↑ Outdoor Wood-Fired Boilers Washington State Department of Ecology. Retrieved July 3, 2008. ↑ 5.0 5.1 EPA's OWHH Program EPA. Retrieved July 3, 2008. ↑ Assessment of Outdoor Wood-Fired Boilers Northeast States for Coordinated Air Use Management (NESCAUM). Retrieved July 3, 2008. ↑ Health and Environment EPA. Retrieved July 3, 2008. ↑ Publications HPBA. Retrieved July 3, 2008. ↑ Program Partners EPA. Retrieved July 3, 2008. ↑ List of Cleaner OWHH EPA. Retrieved July 3, 2008. This page was last modified on 16 May 2017, at 19:09.